"It takes two to plant a tree, and they should take their time over it because they cannot have anything more important to do with the time saved by haste." I discourage summer planting of container grown trees from the garden centre, you may get away with it if you water often enough, but it's better to plant bare-rooted trees in the winter. Smaller trees take best, although a large tree will be OK if you can get it direct from the grower and plant it the day it is dug up. A small tree suffers less transplantation stress. Dig a big enough hole; break the soil up with a fork. DON'T put raw compost or dung into the hole, it will create air pockets as it decomposes (use it as surface mulch by all means), if you like a handful of bone meal and 2 big double handfuls of composted forest bark mixed in with earth will help especially if the soil is dry. Place the tree in the hole and spread the roots out, the planting depth should be no more than 2-3 cm deeper than the tree was being grown in the nursery (you can see the soil mark on the tree if you look) trees planted too deep will die, or un-dwarf themselves if roots from higher up take over from the rootstock. One of you holds the tree straight and at the right depth, the other carefully crumbles and treads down the soil to gradually cover the roots. A useful trick is to get the spade or fork under the roots and jiggle/lever the earth up and down a bit. This lets the earth find its level around the roots and avoids air pockets around the roots, which is a bad thing. Don't stamp down hard or you'll break the roots, press the earth down progressively. Let the one holding the tree watch out the tree stays straight. Should you stake the tree? Not necessarily, but it is ideal if you have time. 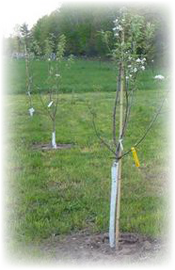 Small bush trees are less likely to need staking, tall standard trees do. Be careful to check and release tree ties or they can cut into and kill the tree as it grows. Old nylons or rubber inner tubes are good or you can buy tree ties from the garden centre. You have now planted your apple tree. Say a prayer, have a glass of cider, or like us do both! Mulching with any organic material is good (but don't pile fresh manure against the trunk as it may encourage disease), water in summer if dry (don't spray the tree with a hose, water the base, a good drenching once or twice a week is better than daily hosing.) A handful of Growmore or similar inorganic NPK nutrient will do no harm, good farmyard manure or compost mulch is probably better, you can do both but don't overdo it-excessive nitrogen may lead to weak sappy growth. Potassium is the most essential nutrient. Seaweed supplies calcium, magnesium and other trace elements- give your tree a balanced diet. Do not allow grass or weeds to grow up to the base of the tree, they will compete for water and nutrient, also provide a hiding place for voles which nibble the bark and can kill a tree. Either use glyphosate, (a non-toxic biodegradable weedkiller), or polythene mulch to control weeds or your tree won't make much growth. Don’t get any glyphosate on the young tree though as it’s toxic to all plants! When it is larger this isn't so much of a problem, but make no mistake grass and weeds will seriously stunt the growth of a young tree.